That's the traditional refrain 'round these parts on this Tuesday of Holy Week -- the day when the lion's share of Stateside dioceses hold their annual Chrism Mass. The lone liturgy designed exclusively for diocese-wide celebration, the event officially known as the "Holy Thursday Mass of the Priesthood" is the year's signal gathering of a local church.... At least, when its scheduling allows it to serve as such; while the rubrics prefer its traditional time-slot of Thursday morning, the Chrism is usually moved to earlier in Holy Week, or even prior to it, to facilitate the convenient and ample participation of as many priests and layfolk as possible. 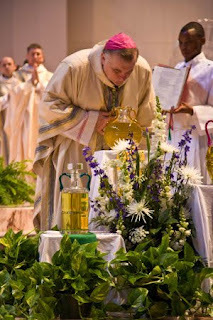 At the Mass, each diocese's yearly stocks of Holy Oils are blessed and consecrated and, led by its bishop, the presbyterate renews its commitment to service first made on its members' respective ordination day. Above left, one of the ritual's key mechanics is shown -- the bishop breathing upon the Chrism (the chief oil used at baptisms, confirmations, ordinations and the dedication of churches and altars), a moment intended to echo Christ's breathing upon the Apostles, when the Holy Spirit was given them. Among many others, today's seen morning or evening Chrism Masses take place in Chicago, Boston, Galveston-Houston, New York, Baltimore, San Antonio, Atlanta, Brooklyn, Milwaukee, Miami and Denver. Among those dioceses celebrating theirs yesterday were Los Angeles, Washington, Portland in Oregon, Providence, Orange and Newark. The Thursday morning custom is maintained in just a handful of places, including St Louis, Pittsburgh, Detroit, Philadelphia and, beyond these shores, Rome, where the Pope leads the celebration in in St Peter's Basilica. Invariably among the first Stateside locales to hold its Chrism Mass is Utah's statewide diocese of Salt Lake City, where the rite took place last Thursday night in the Cathedral of the Madeleine, which marks its centenary this year. 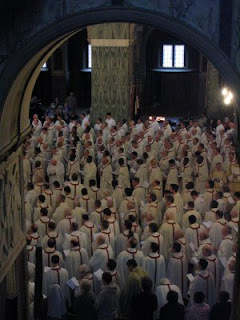 To loop-in those who've never seen a Chrism Mass before -- or for anyone just looking to hear one of the finest choirs American Catholicism has to offer -- fullvideo of the 2008 liturgy is available on-demand, and a lengthy explanation of the meaning and movements of the Mass ran in the last edition of The Tidings, the weekly of the LA church. On a related note, Salt Lake Bishop John Wester's sitting out the Triduum this year -- the lead Levada protege is to undergo prostate cancer surgery tomorrow.